In my usual procastinator fashion, I approached this month challenge almost on the last minute. The last weekend before the posting date to be exact. I envisioned the cake to be the perfect dessert to serve in the intimate dinner party we hosted, with lots of oohs and ahhs, sighs of admiration from our guests. Except I underestimated the amount of time required for the cake and the dinner itself. In my limited time, I managed to cover the cake in ganache, but unfortunately not enough time to do any buttercream decoration. The gateau did leave our guests speechless, probably because they didn't know what to say about the half-naked cake. However, after sampling the cake, they heartily offered their compliments. I know they didn't say this out of politeness, because the two couples volunteered to bring back the remaining cake! 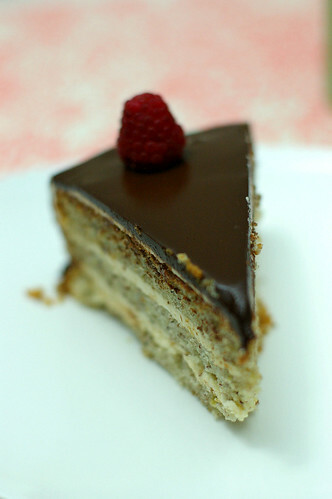 The gateau with its multiple components tasted nice. I followed the recipe and didn't alter anything because I liked to see how the original recipe tasted.The only glitch was the genoise, which I found to be slightly dry. I should have used more sugar syrup. The praline buttercream that was made from scratch, was time consuming and a pain to make, because I had to grind the praline paste multiple times in my small coffee grinder. I must not forget to mention the amount of bowls and plates that awaited cleaning after making each component. But all the work was worth the effort. My dinner guests loved the gateau, which was all that mattered. After making them eat the burnt lemongrass chicken dish, I was glad that the dinner ended on a high note. Thank you Chris, our July Daring Baker host for choosing this recipe. I am glad that I get the opportunity to make praline paste finally. There's still some leftover and I look forward to playing with it in another recipe, along with the few egg yolks leftover. Like many bakers, I draw my baking inspiration from what looks good at the market. At the moment, the limelight falls on blueberries.It is the peak season for blueberries now, and the best time to devour this antioxidant rich superfood. In Georgia, it has been a good year for the local blueberries farms. Excellent crops have been reported, unlike last year, when the Easter freeze had wiped out 86% of the georgia state's blueberries. The good crop has translated into fresh fruits with an endearing price tag to the consumers. Always a welcoming sight when prices of everything else rockets up. The blueberries are sweet to eat out of hand, so some have found their ways into my morning bowl of granola and soy milk. Some have been dispatched to decorate a birthday cheesecake, while the rest of the cohorts are turned into this blueberry crumb cake. The recipe I use for the crumb cake comes from one of my favorite food network host-Ina Garten. Although not a fan of the show itself, I love how simple and tasty her recipes always turn out. 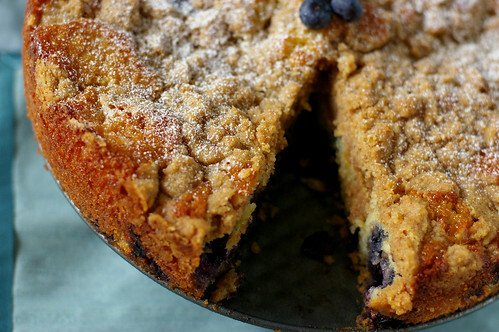 The blueberry crumb cake is no exception. It is fitting for a weekend brunch, or as a dessert after dinner, with a scoop of vanilla ice cream on the side. 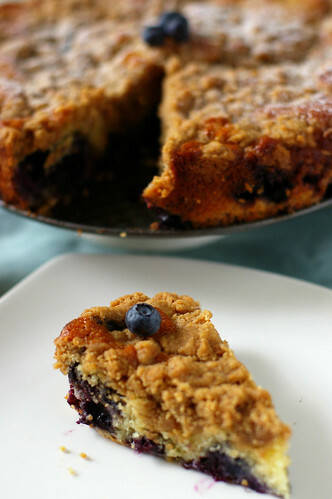 I added in another 1/2 cup of blueberries to the recipe, following a suggestion made by a reviewer on the site. My initial intention has been a thin slice for sampling and photo shoot before sending the rest to OCT's lab. But I like it so much that I succumb to the temptation and sneak another slice onto my plate once my first one is polished! Total lack of abstinance, as OCT would say. Cream the butter and sugar in the bowl of an electric mixer fitted with the paddle attachment on high speed for 4 to 5 minutes, until light. Reduce the speed to low and add the eggs 1 at a time, then add the vanilla, lemon zest, and sour cream. In a separate bowl, sift together the flour, baking powder, baking soda, and salt. With the mixer on low speed, add the flour mixture to the batter until just combined. Spoon the batter into the prepared pan and spread it out with a knife. 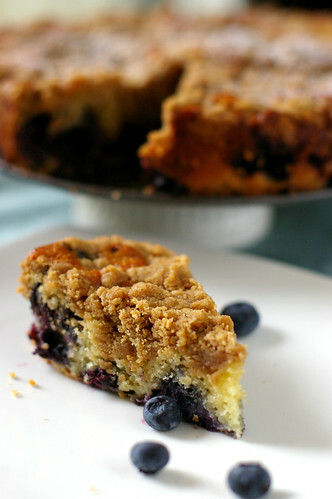 With your fingers,crumble the topping evenly over the batter. Bake for 40 to 50 minutes, until a cake tester comes out clean. 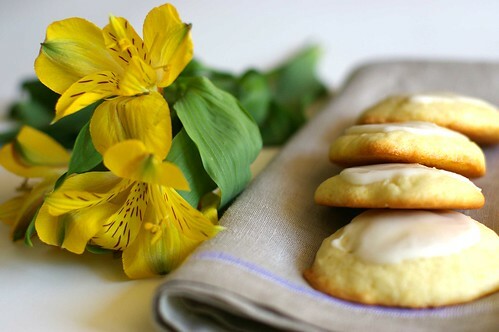 Cool completely and serve sprinkled with confectioners' sugar. Blame it on the heat, I find it hard to sit still in front of the laptop to write you a coherent post about the chocolate matcha cupcakes I made last week. 30 minutes has passed and I am struck after the first sentence. I think I am not going to try too hard for now. Let us just get straight to the cupcakes, shall we? The chocolate cake base is from my favorite author Alice Medrich's book- Chocolate and The Art of Low Fat Desserts . The batter doesn't rise much, but it is moist and chocolatey. Everything you can hope for in a chocolate cake. Most importantly no one can tell that it's low fat. 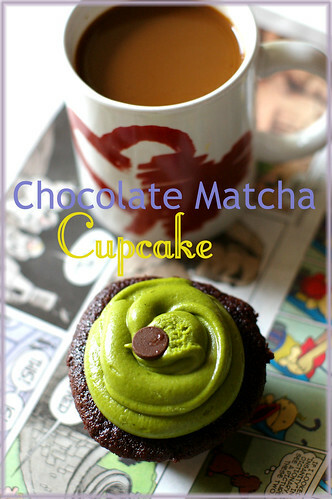 The matcha cream cheese frosting, is adopted from chockylit. I use the Philly 1/3 Less Fat Neufchtel to cut down on the fat content, although I believe one could substitute the fat free cream cheese here with no problem. My tasters love the chocolate cake, but find the frosting slightly too sweet for their tastes. 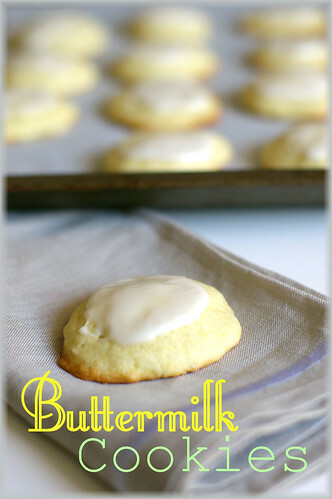 That can be easily adjusted by reducing the amount of confectioner's sugar used. 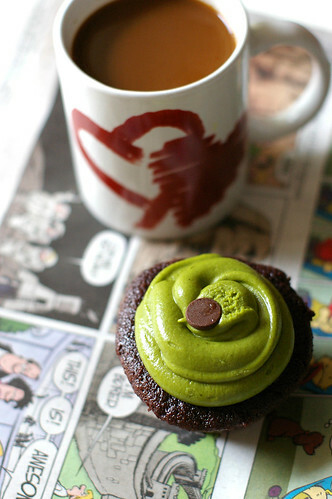 Because I am aiming for a deep matcha flavor, I used a heaping 2 tablespoons of matcha powder in the frosting. You can certainly taste and adjust the amount according to your liking. Tip: If you are looking for matcha powder, try the Asian grocery stores. They are usually shelved with the rest of the tea products. I paid between $4.99-$6.99 for the 1.1 oz tin. 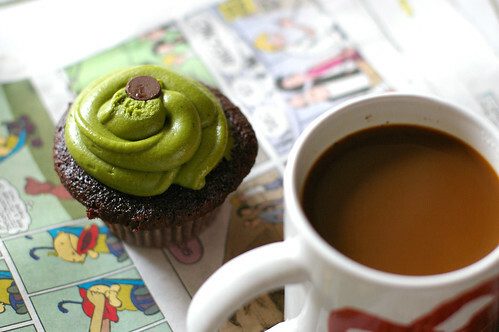 Note that matcha powder is different from green tea powder, which the color and flavor is not as intense as the former. When I couldn't find an Asian grocery store that stock matcha powder in St Louis, I bought mine at Teavana for $16.00!Extortion, I know. Position the rack in the lower third of the oven and prehear ro 350F. Line the muffin pan with paper liners. Combine and sift flour, cocoa powder, baking powder, salt and baking soda. Set aside. Whisk the whole egg and eggwhites in a small bowl and set aside. Combine the vanilla, espresso mixture and buttermilk in another small bowl, set aside. Cut the butter into chunks and place in the electric mixer bowl. Beat to softenend, about 1 minutes. Add the sugar gradually, beating constantly for about 3 minutes, until the color of the butter turns pale. Dribble the egg mixture gradually, beating at high speed for 2-3 minutes. On low speed, add in a third of the flour mixture. On medium speed, dribble in half of the buttermilk mixture, scrapping the bowl when necessary. On low speed, add in a third of the flour, followed by the rest of the buttermilk mixture. Beat in the remaining flour until well combined. The batter may look slightly cuddled. Scoop the batter into muffin cups and bake for about 25-30 minutes, or until toothpick inserted into the center of the cake comes out barely clean. Cool cake on a rack. Sift 1.5 cups of confectioners' sugar and 1 tablespoon of matcha powder into the butter/cream cheese mixture and beat to combine. Taste and add more matcha if desired. I like the matcha flavor, so I used 2 tablespoons in total. 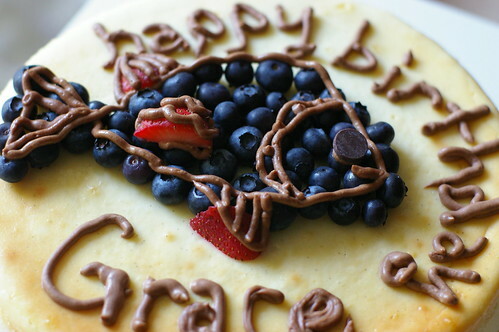 Today is Grace's birthday. Grace is a special friend whom we met through Flickr. Prior to our meeting, I was always awed by her cake decorating prowess and mouthwatering dishes. I could not help wondering who could conjure all these delicious food. Given our shared interest in food and photography, I knew we would become good friends. I remember our first meeting before the bake sale for the China Earthquake which Grace organized. Her friendliness, enthusiasm for good food and zest for life impressed me greatly. After the bake sale, we often chat on MSN and hang out whenever we can. I consider it a gift from above, to know someone as wonderful as Grace. 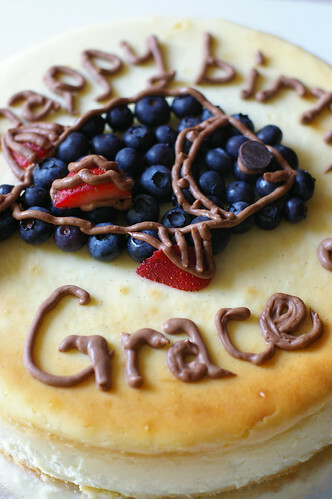 When Grace invited us over for her birthday dinner tonight, I offered to bring a cake. After some deliberation, I settled on a cheesecake. I made her the Vanilla Bean Cheesecake from Junior's Cheesecake Cookbook, which I have baked twice in St Louis. Well, I digress. 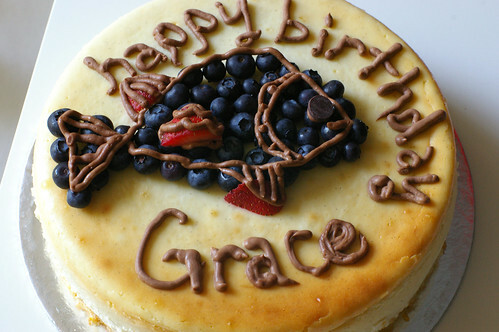 I want to take this opportunty to wish Grace a fun and memorable birthday and all the best for your upcoming MBA class. I know you will make us proud! And thanks for being an awesome friend! The night before you plan to make this cake, put the granulated sugar in a small bowl and bury the vanilla bean in it, covering it completely. Cover tightly with plastic wrap and let stand overnight to flavor the sugar. When you are ready to make the cake, set the vanilla bean for later use. Preheat oven to 350F. (I used 325F)Generously butter the bottom and sides of a 9-inch springformpan. Wrap the outside with aluminium foil, covering the bottom and extending all the way up the sides. Make and bake the cake crust and leave it in the pan. Keep the oven on. Put one package of cream cheese, 1/3 cup of vanilla flavored sugar, and the cornstarch in a large bowl. Beat with an electric mixer on low until creamy, about 3 minutes, scraping down the bowl a few times. Blend in the remaining cream cheese, one package at a time, scraping down the bowl after each one. Increase the mixer speed to medium and beat in the remaining 1 1/3cups vanilla sugar, then the scraped vanilla beans and vanilla extract. Blend in the eggs, one at a time, beating well after adding each one. Beat in the cream just until it's completely blended. Be careful not to be overmix. Gently spoon the batter on top of the crust. Place the cake on a large shallow pan containing hot water that comes about 1 inch u the sides of the springform. Bake until the edges are light golden brown and the top is slightly golden tan, about 1 1/4 hours. Remove the cheesecake from the water bath, transfer to a wire rack, and let the cake cool for 2 hours. Leave the cake in the pan, cover loosely with plastic wrap, and refrigerate until completely cold, preferably overnight or at least 4 hours. Wash and drain the raspberries and place them on paper towels to dry, if using. 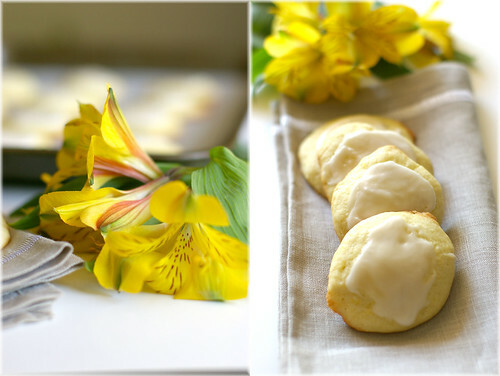 Release and remove the sides of the springform, leaving the cake on the bottom of the pan. Place on a cake plate. Put some confectioners' sugar in a tea stainer and sift enough over the top of the cake to evenly cover it with a fine dusting. 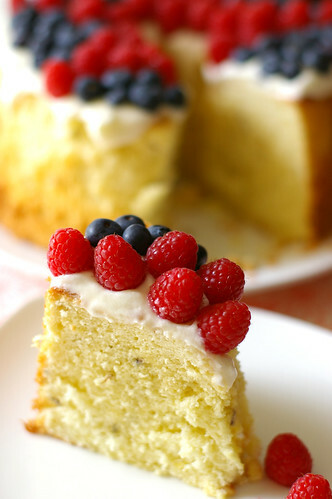 Decorate the top with raspberries. Refrigerate until ready to serve. Slice the cold cake with a sharp straight edge knife, not a serrated one. 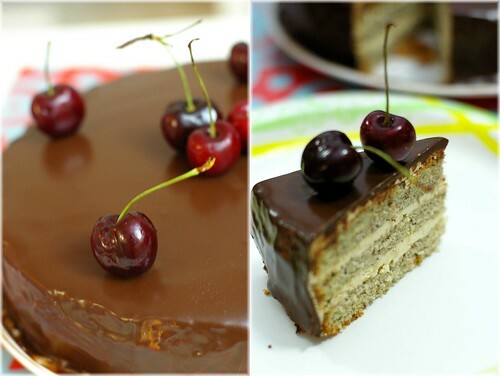 Cover any leftover cake and refrigerate, or remove the decorations, wrap and freeze for up to 1 month. Preheat the oven to 350F and generously butter the bottom and sides of a 8- or 9-inch springform pan (preferably a nonstick one). Wrap the outsde with aluminium foil, covering the bottom and extending all the way up the sides. Beat the eggyolks in large bowl with an electric mixer on high for 3 minutes. With the mixer running, slowly add 2 tablespoons of the sugar and beat until thick light yellow ribbons form, about 5 minutes more. Beat in the extracts. Sift the flour mixture over the batter and stir it in by hand, just until no more white flecks appear. Now, blend in the melted butter. Now wash the bowl and beaters really well (even a little fat is left, this can cause the eggwhite not to whip). Put the eggwhites and cream of tartar into the bowl and beat with the mixer on high until frothy. Gradually add the remainining sugar and continue beating until stiff peaks form (the whites will stand up and look glossy, not dry). Fold about one-third of the whites into the batter, then the remaining whites. It's ok if you see a few white specks, they will disappear during baking. Gently spread out the batter over the bottom of the pan, and bake just until set and golden (not wet and sticky), about 10 minutes. Touch the cake gently in the center. If it springs back, it's done. Watch carefully and don't let the top brown. Leave the crust in the pan and place on a wire rack to cool. Leave the oven on while you prepare the batter. Use the above recipe and technique, except you stir in 2 ounces of melted and slightly cooled bittersweet chocolate when you add the extracts. 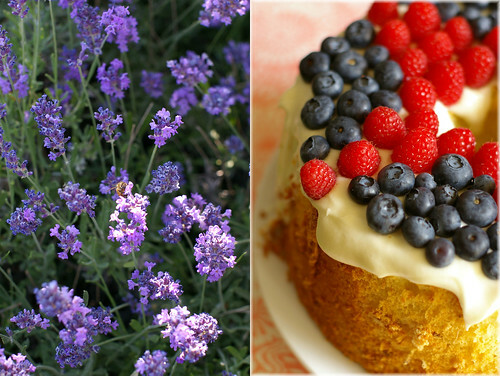 I wasn't going to dress up the lemon lavender chiffon cake, but the berries at the market were just too tempting! Happy 4th July to those who celebrate the festivities! Here's a virtual slice, from me to you. Recipe coming soon on this space, I promise! Enjoy the long weekend y'all! 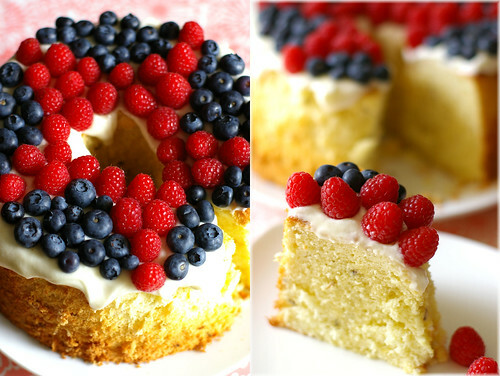 p/s: the berries motif is inspired by this post on The Kitchn. 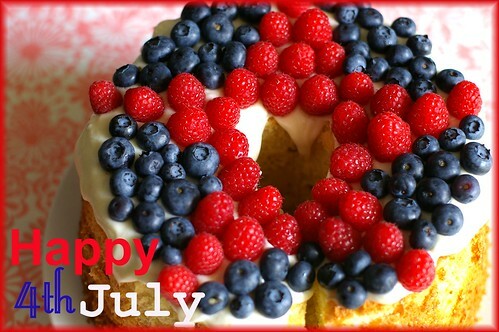 See what I made last year on 4th July here.